The Centre received a report from the State Party dated 7 February 2003. 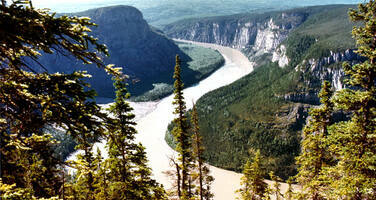 The report provided information on the proposed industrial activities on Nahanni National Park and the expansion of the Park. The Mackenzie Valley Environment Impact Review Board found an environmental impact assessment of the proposed mine at Prairie Creek to be deficient. The Board is awaiting subsequent information from the Canadian Zinc Corporation. IUCN notes the progress in the development of a new Management Plan for Nahanni National Park, which is nearing completion. The report noted that Parks Canada is working with Deh Cho First Nations on the issue of the extension of Park’s boundary. Local communities have agreed to work with Parks Canada and other governmental agencies over the next three years on a detailed feasibility study of boundary options. 2. Requests the State Party to keep the World Heritage Centre informed on the development of the new management plan and environmental impact assessment of the proposed mine at Prairie Creek. 2. Requests the State Party to keep the Centre informed on the development of the new management plan and environmental impact assessment of the proposed mine at Prairie Creek.